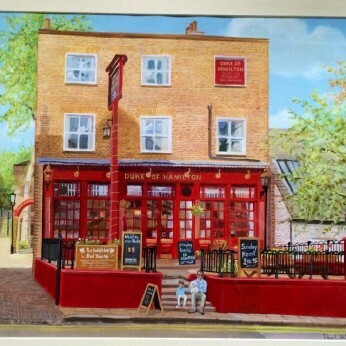 One of the oldest pubs in Hampstead,BEER GARDEN.6 classic Ales on tap-WINNER OF LONDON'S BEST PUB 2011-LIVE JAZZ & Acoustic nights!Good Beer Guide 2015. The locals are friendly and really enjoy what truly is one of the last proper boozers still standing in Hampstead village, it really is a must see. The Duke was the local pub where the late Oliver Reed was seen every day. After the annoying cancellation from tube strikes last weds, THE PANDA RUMBLE is back at Duke Of Hamilton this Weds 15th July! Thursday is our amazing acoustic night! Try something different for £5. come and support young up and coming artists!